Seating areas with fire pits. Outdoor bar and grilling area. Patio expanse with places to lounge, eat, grill, and gather around the fire pit or outdoor bar. Relax and unwind by the fireplace lounge in the lobby. Signature’s award-winning architect was inspired to create a series of unique, light-filled spaces. Fireplace lounge, with indoor lobby and outdoor terrace seating. Serenity-filled courtyard with a tiered water feature. Come home to a welcoming lobby with personalized service offered by 24-hour front desk concierge. Cyber nooks with banquettes and powered tables. Full-sized demonstration kitchen and private dining room available for any occasion. Entertain your guests in the Grand Room, an expansive communal space with a dual-sided fireplace. Art-filled library with private work spaces. Cozy library is a great space to relax or work in. Stop by Signature to see the beautiful artwork featured by local artists from the Greater Reston Arts Center. Comfortable quiet seating with views over the garden and water feature. Complimentary coffee and tea available 24-hours a day. The ultimate hangout with HDTV sports wall, kitchen, billiards, shuffleboard, and foosball. Pet park for your four legged friends. Thoughtfully designed residences with high quality finishes and fixtures. Signature’s sleek interiors come with a choice of espresso or white lacquer cabinetry. Light-filled interiors with large windows and high ceilings. Spacious windows and high ceilings complement the modern design. Signature’s natural materials and sophisticated touches create a home with heart, soul, and best in class finishes. Bathrooms with over sized soaking tubs. Exceptional details such as refined quartz counter-tops and chrome fixtures. 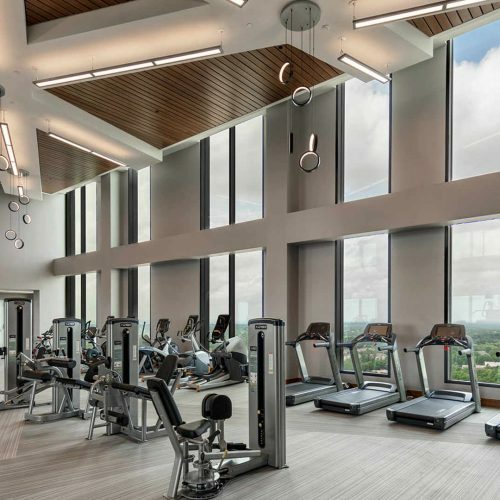 Designed to LEED Silver standards, Signature is as smart as it is beautiful. Signature’s North Lofts building features spacious duplex homes, including some with private patios. Ground-level retail features Balducci’s, a gourmet market specializing in premium and chef-prepared foods. Signature at Reston Town Center. Socialize right outside your front door. Call our brand new apartment community home. Signature’s four interlocking buildings feature extraordinary design and an expansive amenity package. Relax and savor the views from above. Enjoy the Reston Town Center neighborhood. Walk to the expansive retail, shopping, and dining options in Reston Town Center.